Are you generating leads and finding that the buyers who contact you are already far into their decision process, having already identified you as ‘1 of 3’ top but very similar vendors? To prevent the final selection round from becoming a feature-function-price competition and create stronger differentiation, you may need to engage earlier in the Buyers’ Journey. This early demand creation (in contrast to lead generation) requires changing what is in your buyers’ mind, and not what is in your marketing database. That means influencing the early learning process with the right information, presented at the right time, via the right mediums to help decision makers learn about you before they contact you as a prospect. It is not a surprise that the internet, social networks and online communities are key sources that potential buyers use to search for meaningful information during their Buyers’ Journey. These online sources are largely relationship and not broadcast oriented; this means information that stimulates interaction and response is welcomed and encouraged in a ‘community’ setting while obvious marketing spam is most often ignored. 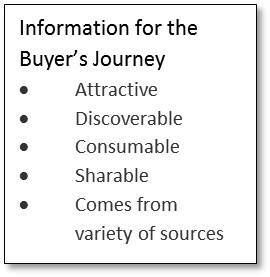 Because of this, information needs to be packaged in buyer friendly content formats that make it attractive, discoverable, consumable and sharable throughout the entire Buyers’ Journey. Think of your information as ‘content as a service”. Provide interesting whitepapers, webinars, blogs, info-graphics and “info-tainment” to engage your buyers and create demand. Be sure to point your potential buyers to sources of information other than your own, which often carry greater credibility. Gain an understanding of the customer’s evaluation and buying process by industry and role within the company. Talk to them about what triggered the need for the solution. Ask them what they were looking for and where they went to find answers. Find out who they spoke with directly and who influenced them and how. And most importantly, find out how they evaluated the information. It’s been my experience that through these meetings you discover how to align your marketing to the buyers’ information needs and to the content formats and outlets that are most effective for an audience. Your analysis of the information that buyers need, and when, where and how they consume it, should inform the process for creating, packaging, and disseminating information and maintaining consistency across communication channels. That process will likely change your current marketing efforts to emphasize demand creation throughout the Buyer’s Journey, rather than lead generation when that journey is near its end. 42 Rules for Growing Enterprise Revenue by Lilia Shirman, is for companies that want to matter more to the customers and markets that represent the greatest opportunities for growth.